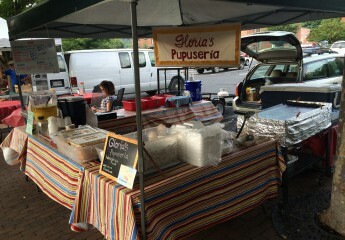 Blog | Gloria's Pupuseria | Serving Pupusas and other Salvadoran style food in Staunton and Harrisonburg! Our new location at 300 N Central Avenue is now open!!! We will be parked on the corner of Lewis and Baldwin Streets in Downtown Staunton Monday through Thursday 11-6pm and Friday 11-3pm! Loca-w/ chicharron(blended pork), veggies, beans and cheese. Chicken-pulled chicken, veggies and cheese. Veggies n Cheese-w/ spinach, zucchini, yellow squash, carrots and onions. Beans n Cheese-fried beans and cheese.